Raced the City Park 4 miler with my running club on Sunday. Time was 26:27 (average pace of 6:37) which put me 14th out of 66 men (there are some fast folks in that club - the top three guys ran 5:48 / 5:45 / 5:41). The weather was strange yesterday in that at race time (9am), the weather was beautiful in the low 60's. By afternoon it was snowing (although none stuck around). Quite a head-wind during the race, I think I could have run 6:32's without the wind. What's weird is that although I had no issues during or after the race, I woke up at 11pm last night with a pretty painful tweak in my right foot. Strange. I must have come down on it wrong (although I don't recall and wasn't really outrunning my pace). I've run harder workouts in the past few weeks - not to mention the mileage this week was only 40 miles - which feels like a vacation now (previous weeks have been about 60 mile weeks). Strange too in that it didn't hurt until after I went to bed. Ah well, it happens. Not a recurring issue for me so I just need to let it heal. I'll ride the bike this week as rehab until it's right again. Hopefully I can pull it back together before the Platte 1/2 marathon this coming Sunday - that's a big race for me. But if not, there's not much I can do except plan for another 1/2. 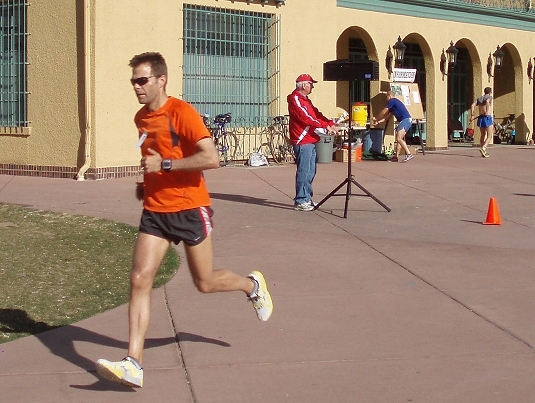 Bolder Boulder 10K is next on the agenda (end of May) - although if I don't do the Platte then I'll have to toss in another race between now and then. Other good news is that while in China I was able to keep my weight down and in fact lost a pound. It's nice to be back to my usual nutrition and diet. The food in China is good, but not overly healthy by sport's nutrition standards (not enough fruit / lean meats and too much oil). "Hulk - S M A S H !"